Most people consider a pond attractive if the water is clean and not stagnant or overgrown with algae. A healthy and attractive pond requires regular maintenance and good planning. 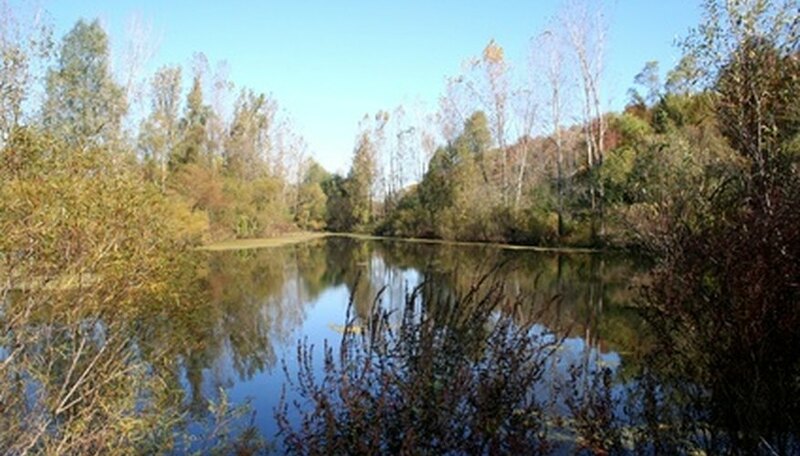 Factors affecting the health of a pond are incoming water quality, the kinds of fish living in the pond and the access other animals such as birds or mammals have to the pond. A good way to keep a pond healthy and clean is to use a variety of plant life strategically planted around and inside the pond. Walk around your pond to find out how the water is coming into the pond. Check if the water is washing over disturbed ground before it enters the pond. Disturbed ground or ground not covered with vegetation is a major source of dirty water entering the pond, which causes cloudiness. Plant a buffer zone of native grasses, or grasses that grow well in your area without extra maintenance, around the pond. This helps clean the water as it runs into the pond. You may need to seed the area several times to obtain a healthy, thick coverage of vegetation. The grass buffer should come to as close as the edge of the pond as possible. If your buffer area is small, plant the largest buffer area as possible. Plant native plants and grasses that are considered marginal plants, such as cattails or rushes, inside the shoreline of the pond. Marginal plants live in water about 6 inches deep. Choose plants that are adapted to your area and that live in either a constant level pond or a fluctuating level pond, depending on your situation. Marginal plants capture soil as it enters the pond. Plant native plants, such as water lilies, which float on the surface of the water and shade the bottom. Plant these directly into the bottom of the pond. The shade from these plants keeps smaller plants, such as algae, from naturally forming in the pond. Keep in mind that floating plants and many water plants that are rooted to the bottom of the pond can become aggressive and take over. One option is to anchor the roots of the water plants in pots weighed down with gravel.